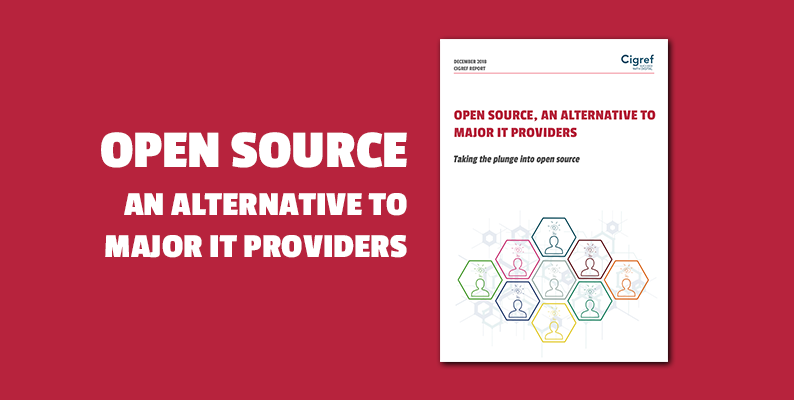 In the context of the 4th edition of the Paris Open Source Summit (POSS), the first event in Europe on open source, free software and open digital technology, Cigref published a report “Open source, an alternative to major IT providers”. Led by Stéphane Rousseau, CIO Eiffage and administrator of Cigref, the “Alternative to major IT providers” work group focused on an essential component of an IT strategy: Open source. With digital transformation, the scope of action of the information systems (IS) of companies and public organisations is constantly expanding. They all share the same objective of controlling their IT budgets. Companies are relying on their providers to gain room for manoeuvre on these budgets. In a context where business innovation is based to a very large extent on digital services and tools, the relationship of companies with their providers is crucial in terms of the challenges of competitiveness, agility and performance. Today, the world market for software licences and digital services is concentrated in the hands of a few international, mainly American, major players. Their goal is to increase their turnover which has become unsustainable for companies and public organisations. In addition, they are increasingly refusing to bear the costs of solutions that have become commodities, that have only very limited innovative value, and that make them dependent on a hegemonic provider. Companies and public organisations are therefore looking for alternatives to loosen the financial stranglehold of providers and gain room for manoeuvre in their negotiations with software editors. Free software, known as “open source”, is one alternative. Furthermore, it gives companies strategic advantages and action levers on their competitiveness. Opting for open source obviously incurs costs. Indeed, before adding these solutions to the scope of possible alternatives, companies must acculturate their employees, explain the specificities of this ecosystem to them and establish governance in the selection of software. This also requires the in-house or outsourced development of skills to understand the roles of players, along with specialist technical resources if the company wants to develop certain specificities in order to meet a specific need. Open source challenges risk management modes: major IT providers constitute guarantee brands, an insurance policy, and a guarantee of security for the Executive Committee. However, solutions exist in free software for each risk identified. In addition, open source solutions meet today’s challenges: time to market, agility at scale of the company and open innovation. They facilitate the collaboration and pooling of software developments. Free software also provides continuity, security, flexibility with open formats, a wider testing coverage in multiple use cases within large communities and sometimes possible influence on the roadmap (development plan). Open source ultimately offers leverage to improve the skills and attractiveness of talented individuals. Open source sometimes even constitutes the condition for attracting young generations. These are all reasons why some companies, strongly supported by their Executive Committee, apply a strategy that explores all solutions, and in particular, open sourcesolutions. Some have even adopted the “open source first” strategy. Define criteria for analysing open source software, shared by the entire company and that take into account long-term risk taking; for example, intellectual property, type of licence, user and developer communities, etc. This selection takes into account the level of dependence on proprietary software solutions of major suppliers and the possibility of pooling developments. Similarly, set up a software or support selection process.